Basil Lime Sparkling Green Tea with S.Pellegrino Sparkling Mineral Water is a refreshing way to face the heat of summer! This post is sponsored by S.Pellegrino Sparkling Mineral Water but the content and opinions are my own. The weather is so hot lately! It’s been so hot lately. We drove through parts of central California last week, and it was 115 degrees! Wow! I needed a nice refreshing drink to help keep me cool. Heck, pretty much any hot summer day I want a refreshing beverage to keep me hydrated. My Basil Lime Sparkling Green Tea is just the thing to refresh and make you happy on a warm summer day. Take it on a picnic. Drink it in your backyard while you sit and enjoy the weather. Drink it at a pool party. Summer doesn’t last very long, so make the most of every day. This is something I’m trying to do more of, take time to enjoy life. The little pleasures in life. Hanging out with family, loved ones. Sitting with friends. Chatting. Playing with my cat. Life should be filled with fun. Filled with laughter. Filled with tasty food and drinks. This Basil Lime Sparkling Green Tea will help you pause and relax, refresh. And, I love this drink made with S.Pellegrino Sparkling Natural Mineral Water. In 2016, S.Pellegrino® launched their Taste Guide, an online destination to explore food inspiration and trends. They found some really cool and interesting things. One of the trends that helped inspire me for this Basil Lime Sparkling Green Tea was their discovery that “Classics With a Twist” are popular. S.Pellegrino also found that Asian Cuisine Reigns Supreme. Well, what could be more fun than an Asian green tea with a twist of basil & lime? Green tea is such a classic part of Asian food, and my basil lime twist makes it fun! Of course, sparkling green tea just makes it perfect! Use any basil you have growing in your garden; I used sweet basil for my basil syrup. Thai basil would be delicious and in keeping with the Asian theme. Lemon basil would also be great, and a nice citrusy kick. If you want to check out the Taste Guide, hop over here and give it a look, gather some inspiration, and enjoy! 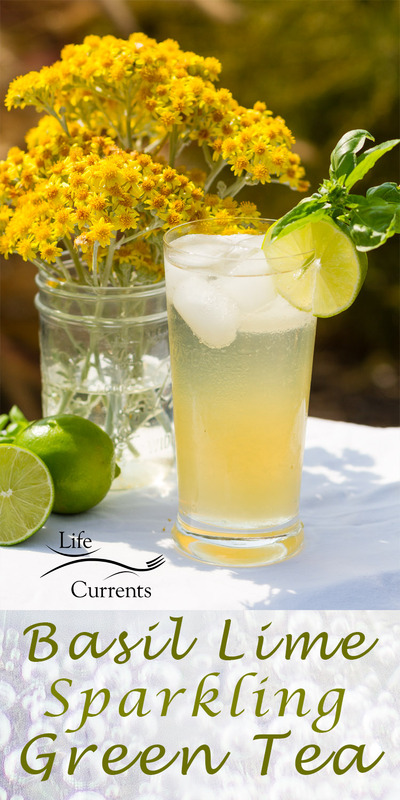 Be sure to see the recipe card for the Basil Syrup below the Basil Lime Sparkling Green Tea recipe card. Basil Lime Sparkling Green Tea is just the thing to refresh and make you happy on a warm summer day. It'll help you pause and relax, refresh. And, I love this drink made with San Pellegrino® Sparkling Natural Mineral Water. Pour chilled green tea, lime juice, and basil syrup over ice and stir to mix. Top with chilled S.Pellegrino® Sparkling Natural Mineral Water. Garnish glass with lime slices and fresh basil sprigs as desired. Add all ingredients to a small saucepan, and bring to a boil. Let the sugar dissolve, and boil for one minute. Take the pan off the heat, and let steep for 10 minutes. Strain out the solids. Allow to cool before using. The syrup will keep in the fridge for a few weeks (if it lasts that long). What a dreamy post! I want this drink, i want to be at this picnic…so lovely!